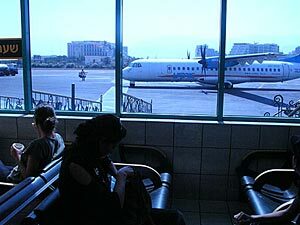 The development impetus of Eilat at the outset of the 1950s, and the distance of the settlement from the center of the country, brought about the development of a regular air service from Lod Airport (BGA of today) and later from Haifa. All the regular flights were undertaken by Arkia, and prior to that by Ilta, a subsidiary of El Al, and by Aviron. In 1964, the runway was extended to 1,500 meters, and a small passenger terminal was built. In 1969, the runway was extended to its current length of 1,900 meters. In 1975, the first charter flight, by Sterling Airways of Denmark, landed in Eilat, and since then international charter flights have been landing regularly at the Airport. From the mid-80s, El Al also began operating regular flights to Europe. In 1990 – 1991, due to the Gulf War, the charter flight season was curtailed, which affected the international flights to Eilat. 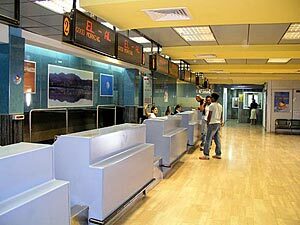 Eilat Airport today serves internal civilian flights, international charter flights, private flights and special flights. Additional Information: Recent addition of the elevators for disabled access in the departures and in the arrival halls. ATM at the enterance to terminal.